The origin of Bornay goes back to the desire of its President, Juan Bornay, to produce electricity using the wind, and to make it reach places where there was none, as was the case of his grandparents’ home. Starting from a small electricity workshop for automobiles and a die stamping press, Bornay came into existence at the beginning of the 1970s. 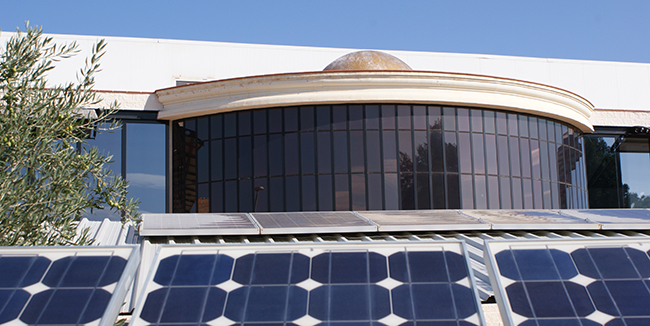 Since 1970 providing solutions to the world of renewable energies. of the wind is breaking through just as the planet is shaking off the hangover of the recent great oil crisis. Serial production begins with the G200W model equipped with an induction alternator, which improves the startup point at low wind speeds. 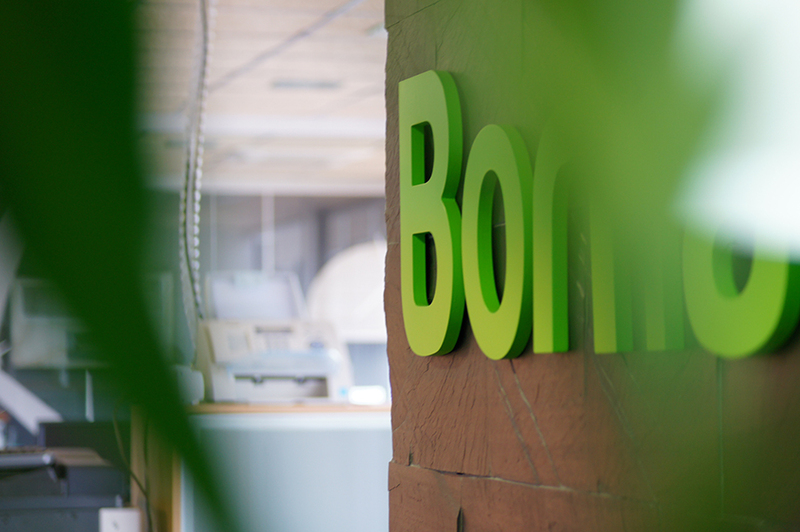 Bornay reaches new markets: the United States, Mexico, the Dominican Republic and Argentina, among others. At the same time, in Africa, Bornay’s wind turbines and windpumps calm the thirst of large areas of Angola and Tanzania. 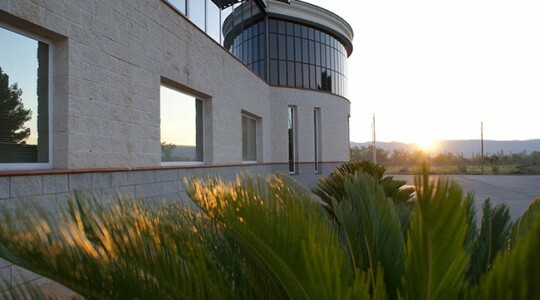 essence is enhanced by intense production and sales activity. America, Europe, and Africa now count on Bornay reliability. 1988 Permanent magnet alternator. Adjustable blade Pitch. The company has consolidated and matured. Innovation and the urge to supply places in need of energy inspires Bornay to new heights as the company creates a new windturbine equipped with a 250W three-phase permanent magnet alternator complete with adjustable blade pitch. This boosts the features of the Bornay, especially in low and medium wind speeds. The introduction of an automatic brake system and mechanical blade pitch control means the attack angle of blades can be adjusted relative to the wind, bringing startup with low wind conditions and control at high speeds - a constant challenge for Bornay. In fact, in a few short years this innovation will be improved upon with the production of a windturbine incorporating an adjustable three-bladed rotor and 500W nominal power. 1993 Fiberglass/carbon fiber blades. Tilting brake. 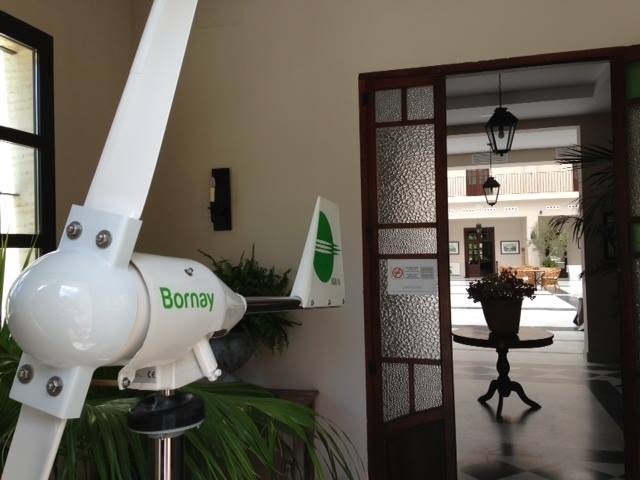 Bornay heeds market requirements and comes up with a smart answer, creating a new range of windturbines: Inclin range, with power options of 250W, 600W, 1000W and 2500W, robust machinery replacing the adjustable blade pitch with a tilting brake system, and using fiberglass/carbon fiber blades in place of injected nylon. Now the world starts admiring Bornay’s greater sturdiness, durability, and reduced maintenance needs. 2000 Fiberglass/carbon fiber blades by RTM. 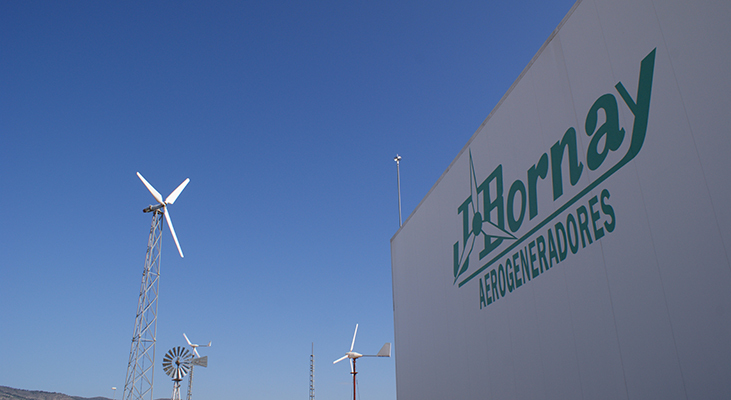 Three decades after Juan Bornay’s earliest prototypes and his wind simulation experiments, Bornay is now a prestigious name brand in the nascent renewable energy industry. 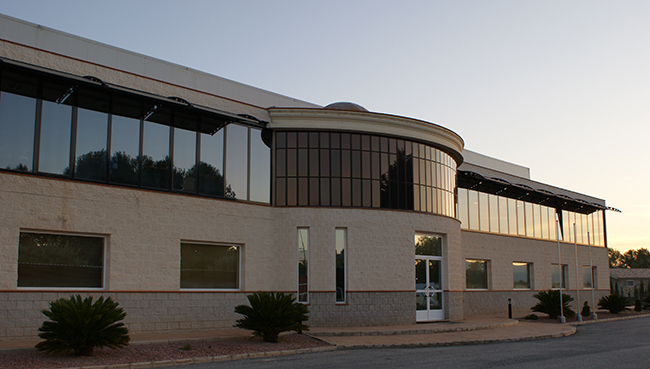 Through constant innovation and productivity improvements, the firm has also secured a solid international distribution network. With serial production of 5 models ranging up to 6KW, Bornay takes a new step forward, developing a new RTM-based production system of fiberglass/carbon fiber blades, achieving a weight/resistance ratio that is unique in the marketplace. Bornay outlines its current strategic plan: Bring the world clean energy solutions as one of the key worldwide manufacturers in small-scale windturbine production. There is now no turning away from the need to make efficient, clean energy production systems available. Bornay sees this challenge as an opportunity and is creating specific windturbines for connection to power grids that comply with each country’s national norms regulating the flow from small wind power. This transformation means Bornay is now moving towards the synergy of adding in energy from other renewable sources such as photovoltaics. This planet will not now conceive of any form of development which does not respect the environment. Resources are dwindling. But energy demands are greater than ever. What started as a dream is now a priority. 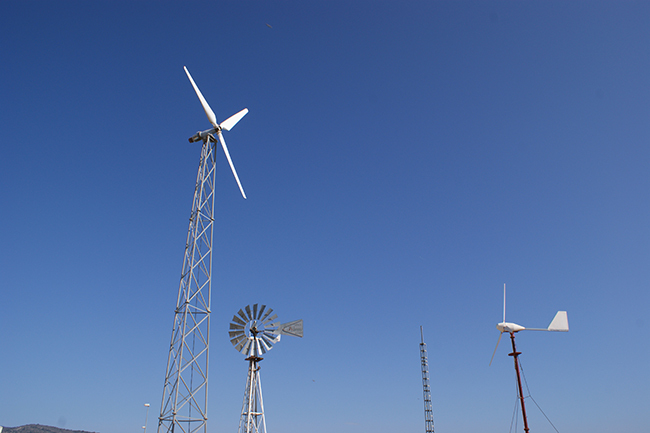 Harnessing wind power and manufacturing reliable windturbines is a guarantee of commitment to the sustainability of the planet. 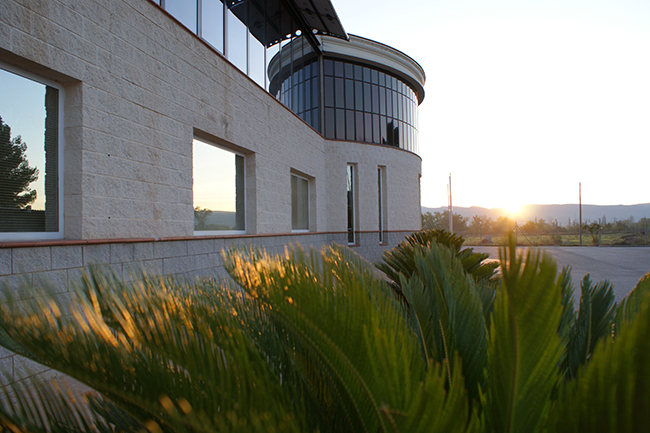 Against this backdrop, Bornay has a presence in 50 countries as a reputable firm backed by its history and the sturdiness of its machinery. And it wants to bring the world renewable energy solutions and invite industry’s best professionals to carry on evolving and join the Bornay experience. Bornay appears in the early 70’s under the direction of Juan Bornay, and today it continues to be a family firm, now in its second generation. At the present time the organization has 30 collaborators, both internal and external. During all this time, the motivating force of the firm has always been based on two goals: to take energy to where there was none and to make Bornay an inspirational company. Inspirational... in the professional sense, having successfully carried out more than 6000 small wind turbine installations in more than 50 countries. Inspirational ... regarding the members of our staff, because we help them grow, develop and become stronger every day. Inspirational... in our relations with clients and suppliers, with whom we promote close contact in order to create synergies for mutual enrichment. Inspirational... as regards innovation, because we are flexible in evolving with the changing times and in furnishing our clients with continual improvements. Inspirational... because our policy of Corporate Social Responsibility includes, from the very heart of our company, actions that affect our locality and end up as international projects which attempt to make life easier for others. This is the time. Do not hesitate.